If you are using your Toon Boom product in English, Chinese or Spanish, you can try it by first getting the trial version from the Toon Boom website, then activating your trial license. 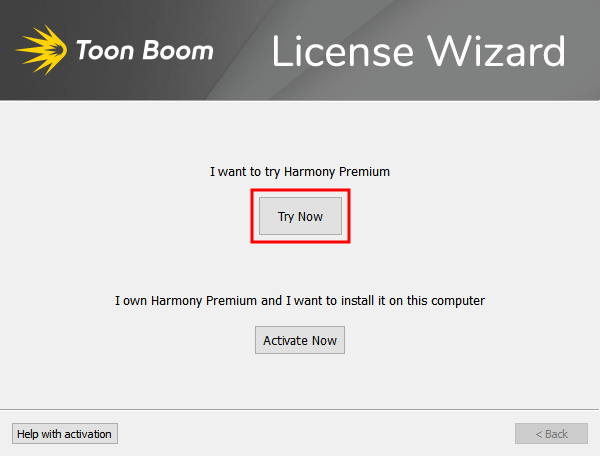 You can activate your trial license by launching the product, then signing in to your Toon Boom account at the activation prompt. You will then be able to use the software for free for 21 days. If you are using Harmony in Japanese, see Using a Toon Boom Product in Trial Mode. Activating a trial requires a direct connection to the Internet. Make sure that you are not connected to a proxy and that your firewall or network is not configured to block access to the Internet. The package you downloaded is actually the full version of the software, but you will be using it with a trial license. Hence, you can easily upgrade from the trial version to the full version later by purchasing and activating a full license, without having to reinstall the software. The Try Now dialog appears. The Activation Successful screen appears. It confirms the product you activated and the date at which your trial period will end. Congratulations! Your Toon Boom product trial is now activated on your computer.